My quill attachment for my Lendrum arrived last week. I was feeling pretty moody last week (messy house/loom outside syndrome again), so of course I helped myself to another dose of misery by checking the sites again for the walnut quill attachment. Yup, I confirmed they were still sold out. Then, for no reason other than sheer bull-headedness, I decided to call a small store in the mid-west whose site hinted at some walnut accessories. Well: they had it, I bought it, they sent it, I got it. Three days later. The mailman was so proud of himself for delivering it. As I took it out of the box, DS immediately commented “I like your new gun, Mama.” One hour later as I rub my injuries: “What does it mean ‘impale’, Mama?” Aha! I know what Sleeping Beauty was spinning on! 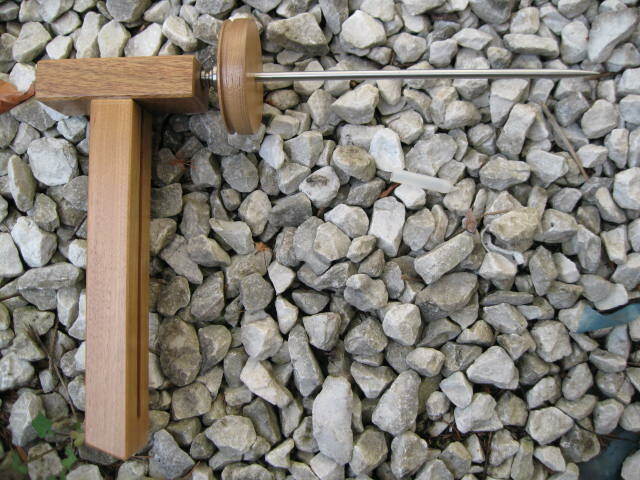 3) Getting a feel for a spindle before using a great wheel or charka. I’ve seen some novelty yarns where one of the plies was threaded with beads. 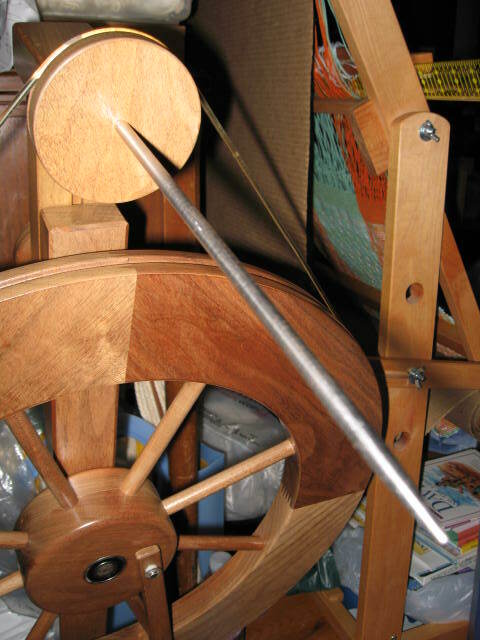 I should note that a quill attachment is not a necessity for spinning cotton, silk, or flax; although it is a good substitute for a charka wheel. Did I purchase a quill attachment for any of the valid reasons listed above? Sadly, no. Those are the reasons I’ve come up with after the fact, to justify my purchase. No, I thought I had to have a quill because I’m a speed demon on my treadles and I have a need for speed that hasn’t been served by my current flyer ratios. I’ve had a fast flyer on special order through my LYS (since I rarely purchase yarn, it really ought to my LSS — Local Spinning Store — or LWS — Weaving) since February. My wheel is the limited edition walnut-coloured one made in 2001, so parts aren’t as readily available. And because Mr. Lendrum has so many orders and does all the work himself, the supposedly two-month waiting period is now at the half-year mark. After I placed my order, I found several places online with the flyer in stock so I could have the flyer in my hands tomorrow by overnight express… But my LSS didn’t require a deposit for the special order, and I’m loyal to them for that; so I’m still here, waiting. SIX. Months. Later. 3) the quill on the Lendrum is angled downward rather than horizontal. If using a great wheel, winding on doesn’t take much more time or wasted motion because stopping and reversing the wheel direction is as fast as spinning, since turning the wheel is completely controlled by the hand. On a foot-treadled, upright wheel, stopping to reverse and wind on takes up a lot of extra time (at least on my wheel) since it’s not easy to immediately stop and start up again. All in all, I had fun trying out the quill; and it will be useful when I want to spin or ply bulky, novelty yarn. Also, it’s cheaper than the plying head, although the two function differently. 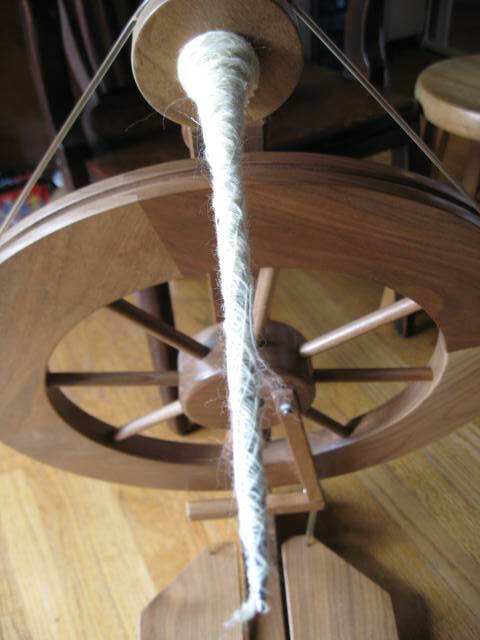 (The only reason why I still want the bulky plying head is because it is perfect for spinning Judith MacKenzie’s Wolf Yarn – I’ll have to give it a try on the quill sometime.) Also, the shock of being completely wrong about the quill has dampened (at least temporarily) my impatience for my fast flyer. And I learned that the Rio Grande won’t be my first choice for a production wheel. Still, there’s no need to delay work on my flyer, Mr. Lendrum!